Easter is an important religious celebration for people of the Christian faith. If you're wondering how to include your older child in the celebration, don't worry. Your child may be too old for some of the Easter activities, but there are still plenty of other options to consider. The Easter fun suggestions below are ideal for older children. Whether you attend church regularly, or just sporadically, consider spending Easter morning attending services with your child. For Christians, Easter is a sacred and the year’s most important religious holiday. By attending services, you give your child the opportunity to truly understand what the day really means to people of faith. Stuffing Easter baskets is almost as much fun as receiving them. Now that your child is older, he or she may get more out of helping others than by receiving a basket full of candy and chocolate. Reach out to area non-profit groups, such as your local food bank, nursing homes, or even to the local fire department. Ask what items the residents or volunteers could use in their baskets, then go shopping for the items together. It might even be fun to assemble baskets for the animals awaiting adoption at your local animal shelter. Making some Easter fun can be as simple as getting a good meal on the table. Tweens love to contribute and since they’re old enough to take on more responsibility, parents should take every opportunity possible to teach them new skills. 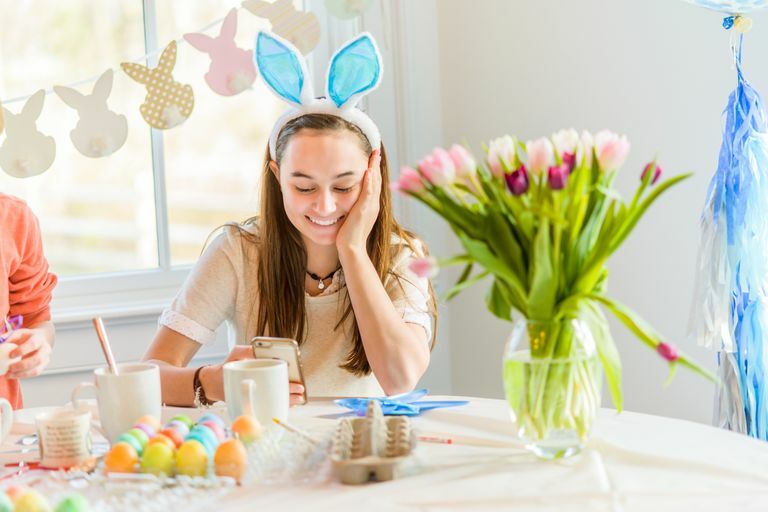 Sit down with your tween and plan Easter dinner together, taking the time to select menu choices that will appeal to the entire family. Divide the cooking responsibilities, putting your child in charge of tasks that he or she can do without your supervision, such as making the salad or decorating the dinner table. OK, so you don’t want to stuff your child’s Easter basket with a boatload of candy, but the Easter season requires you enjoy a tasty treat or two. Your tween will have fun creating a cute bunny-shaped cake. Provide the ingredients, a little supervision, and watch her have some Easter fun. Nothing says “Easter fun” like an egg hunt. Your preteen may scoff at attending an Easter egg hunt, but he may relish the idea of being in charge of a hunt for younger kids. Have your child organize an egg hunt for younger siblings, or for the younger neighborhood kids. Shopping for eggs, prizes and selecting fun hiding spots is all a part of this fun Easter activity. Or, try putting your child in charge of dyeing the Easter eggs. Just make sure you cover the kitchen table with plenty of newspaper. OK, so the traditional egg hunt may be out for your older child, but you could invite your child’s friends over after dark for a glow-in-the-dark Easter egg hunt or another easter game. Afterward, invite the kids in for treats and punch. Your child can figure out what to put in the kids’ goody bags.